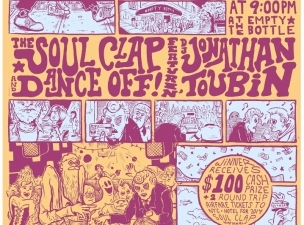 Unfold your arms and shake your butts over to the Bottle tonight for another SOUL CLAP & DANCE OFF featuring none other than DJ JONATHAN TOUBIN! The party never stops here so we figured why not invite one of the finest rock and soul DJs in the country back to our stage, and this time with an even bigger prize. The winner of Mr. TOUBIN's DANCE OFF will be rewarded with $100 cash PLUS two round trip airfare tickets to NYC & hotel for the Soul Clap Nationals in January 2014! Founded in New York City, the concept is simple: All-night dancing to the wild soul 45s of subterranean superstar Mr. Toubin and, near the end of the event, a $100 dance contest judged by a community panel. Cash is great. But so is a trip to Brooklyn for the Dance-Off Championship at Brooklyn Bowl. Don’t miss your chance to dance your way to New York City for free! And you can dance guilt-free cause a dollar of each ticket sold will go to benefit the local sustainability non-profit, Slow Food Chicago. Recession-friendly mass entertainment with a cheap door price, the dance party/spectacle not only sells beyond capacity at home, but has brought its excitement to domestic and international markets alike. The Dance-Off portion features judges from every edge of music and culture tonight's panel will include... *Alison Cuddy from WBEZ, Mia Park from ChicAGoGo Show, Christen Carter of Busy Beaver Button Co, Grumpy from Sweet Cobra/The Party Downers, Sasha Hodges of kokorokoko, Hollywood Holt, Herb from Liar's Club, and Keeks La Reine & Twiggie Smalls of The Revelettes!